Transport For London is challenging motorists to test their change blindness in a campaign designed to increase the safety of cyclists. 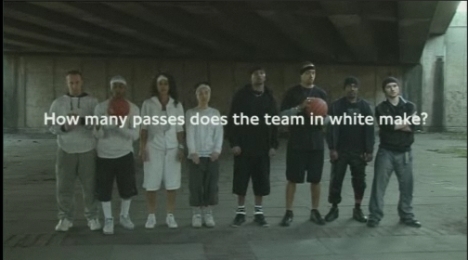 The test, online at www.dothetest.co.uk, challenges viewers to watch a video of two teams of young people playing with a basketball. How many times does the white team pass the ball? The results of the test demonstrate something called change blindness, in which only a tiny fraction of all the information going into your brain enters your consciousness, and inattention blindness, in which concentration on one thing can lead to other events going unnoticed. The Do The Test campaign was developed at WCRS, London, by executive creative director Leon Jaume, creative directors Yan Elliott and Luke Williamson, art directors Kit Dayaram and Vince Chasteauneuf, copywriters Tom Spicer and Simon Aldridge, agency producer James Lethem, and assistant producer Laura Crowther. Filming was directed by Chris Palmer at Gorgeous, London, with editor Paul Watts.